NEW YORK, June 25 /PRNewswire-USNewswire/ -- Close to 50 anti-Zionist rabbis and laymen demonstrated yesterday in New York City at 390 Park Avenue, corner 54th St, outside the offices of RFR Holding LLC, a company now in the process of building a 60-million dollar hotel in the city of Jaffa in the Holy Land. The demonstration took place several days after archaeologists from the Israeli Antiquities Authority unearthed ancient graves of holy Jewish sages at the site, estimated to be approximately 2000 years old, to clear the area for constructing the hotel. This desecration, which was only one more link in the decades-long chain of rebellion against G-d and religious persecution perpetrated by the Zionists, once again aroused feelings of outrage among religious Jews around the world. Major demonstrations were held in New York, London, Montreal, Ottawa and other locations. Especially intense were the protests held at the historic cemetery itself. As religious Jews cried out in pain over this wanton disrespect for the dead, the Israeli police attempted to silence and disperse the demonstrators with murderous cruelty, wounding more than 40 of them. The wounded were taken to hospitals for treatment. Yesterday's demonstration at RFR Holding LLC in Manhattan was called after the company issued a statement that despite all the opposition to their project, they planned to continue excavation and construction this coming Sunday. This construction will involve additional desecration of the graves, such as drilling deep poles in parts of the cemetery not cleared by the archaeologists. 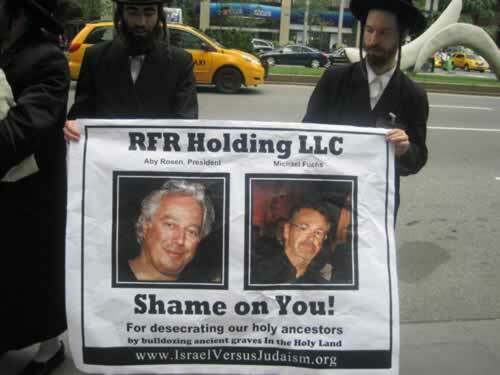 "Israeli = Thuggery Against the living and the dead", "RFR Holding LLC, Aby Rosen & Michael Fuchs, Shame on You!, For desecrating our holy ancestors, by bulldozing ancient graves In the Holy Land", "Judaism condemns the State of Israel and its atrocities", "State of Israel: the Land is not yours and the bones are not yours", "SOS: Jews Oppressed in Israel Spiritually & Physically", "State of Israel: Heresy, Murder and Theft"
Demonstrators were attacked by certain Israelis, who began ripping up the signs, but the police quickly restored order. Rabbi Yoel Loeb, a spokesman for Neturei Karta International, Jews United Against Zionism, said: "Recently, a Swiss construction company in the middle of a project ran into an old Jewish cemetery. They immediately contacted the local Jewish community and asked them how to deal with it. Also recently, in the Zionist state in the Arab neighborhood of Gabel El Mokbar, after the Zionist army demolished the home of an Arab suicide bomber and a cemetery was discovered underneath, the Arab residents agreed to treat the area in accordance with Jewish religious law. But the Zionists and their companies do not even have the bit of human dignity to respect their own ancestors. 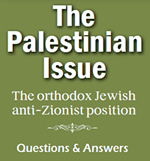 "The world must know that the Zionist regime commits crimes not only against the Palestinian Arabs, but also against religious Jews who do not agree with its goals. Not only do we condemn their cruel acts against the Arabs and the Jews, and the other crimes that they commit against the Jewish religion; we are strongly opposed to the entire existence of their state, which is completely against the Torah. According to Jewish belief, Jews were placed in exile by G-d, and are forbidden to found their own country by physical means. "The ongoing Zionist desecration of all parts of the Torah is just another proof that they do not represent religious Jews, and certainly not the Jewish religion."